It only takes one month to see some big tricep gains! 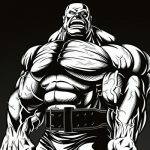 Guide for Building Big Triceps Fast! If you want bigger arms then get off the preacher curl machine right now and find the closest dip machine, or hit the dumbbell section for some overhead extensions because you need more tricep workouts in your life (If you didn’t you wouldn’t be reading this). Triceps make up two/thirds of your upper arm mass and when fully developed, they’ll make your sleeves skin tight! Now, there are so many Tricep exercises out there that it can be an overwhelming decision to choose the right ones. But that’s why you have us to guide you, and we’ll make sure you’re not missing out on any gains! Now, triceps play an integral role in your chest and shoulder development and it’s imperative that you prioritize their development to increase mass and strength in these much larger muscle groups (Weak triceps = weak chest and shoulders). For example, your triceps do a lot of pushing during the barbell bench press exercise so if you have weak triceps, your chest will suffer in development. Why are these exercises the best? It was the triangle push-up! Yes, we’re just as surprised as you are. But the other seven exercises were just as surprising based on the EMG activity. So, we’ll base the program from these chosen exercises since science says they are the standard for tricep exercises based on muscular activity during EMG testing. You’ll be training your triceps twice per week with two workouts per week. Rest at least four days between the two Tricep workouts to recover before you go at it again. Increase the resistance used every week for free weight exercises in five-pound increments and ten-pound increments for cable exercises. But increase the reps by five every week for the triangle push-ups since it’s a bodyweight exercise. How Often Can I Do This Four-Week Program? It’s recommended to do this workout no more than two or three times per year if you’re a natural lifter since there is a lot of volume required. Generally, your compound chest and shoulder exercises provide plenty of stimulation for the triceps in combination with less volume from isolation exercises. This four-week intense program will stack on the size and strength if you train with optimal intensity but you also must eat a proper high-protein diet to rebuild your muscle tissue after every workout. But, make sure to increase the weight every week with the recommended increments and you can rest assured you won’t be leaving any gains on the table. The triceps are an impressive muscle capable of a lot of power and sleeve-splitting potential so take these four weeks seriously and you’ll likely want to come back for more. But like mentioned previously, the workouts do require a lot of volume for the average natural lifter so try to limit yourself to no more than two to three four-week workouts per year to change things up. We hope this guide serves you well in your attempts of achieving tremendous triceps! 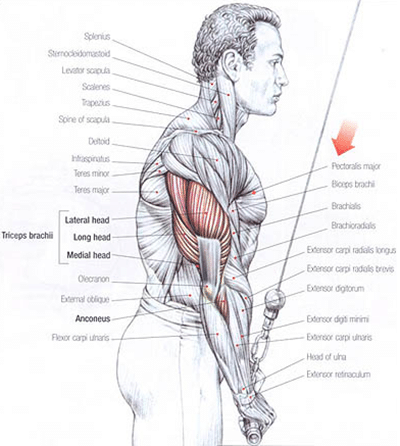 “Triceps Brachii”. UW Radiology. Retrieved 2019-04-02. Landin, Dennis; Thompson, Melissa; Jackson, Meghan (2018-4). “Functions of the Triceps Brachii in Humans: A Review”. Journal of Clinical Medicine Research. 10 (4): 290–293. doi:10.14740/jocmr3340w. ISSN 1918-3003. PMC PMCPMC5827912. PMID 29511416. “Triceps Exercise: The Best Tricep Exercise for Women”. ACE Fitness. Retrieved 2019-04-02. “Electromyography (EMG) – Mayo Clinic”. www.mayoclinic.org. Retrieved 2019-04-02. “Before, During and After Your EMG Test”. www.hopkinsmedicine.org. Retrieved 2019-04-02.